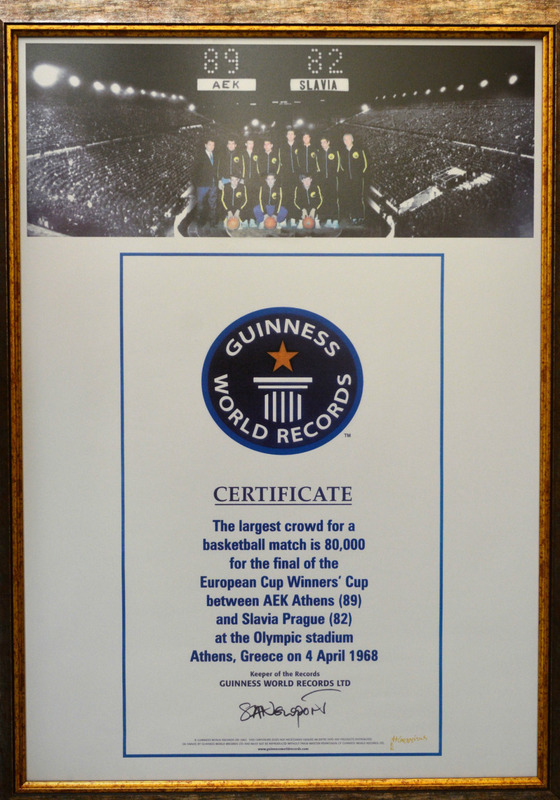 On April 4, 1968 a Greek sporting triumph took place when AEK won the European Cup in basketball in front of 80,000 spectators at the Panathenaic Stadium in Athens. It was the first time in the history that a Greek team won a European cup. 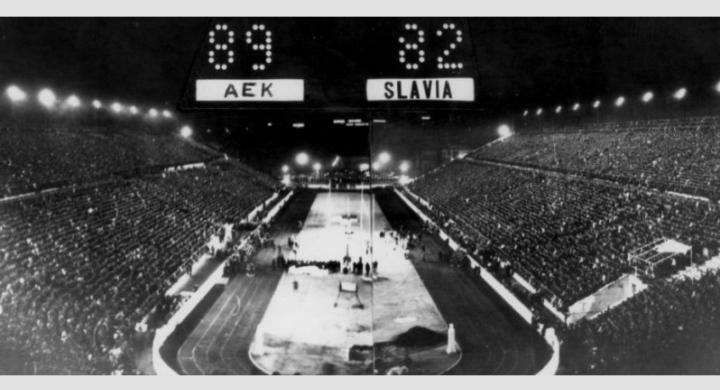 AEK’s victory over Slavia Prague was also a triumph for a suffering Greece that for a second year was under the boot of a military dictatorship. The junta, sensing a public-relations opportunity, removed all curfews and barriers, allowing people to gather for this special night. A massive crowd of 80,000 was allowed inside the stadium: 65,000 seated and another 15,000 standing ticket holders were gathered in anticipation of the great final. It was a surprisingly large number for a sporting event at the time and still a Guiness World Record for attendance at an outdoor basketball game. Outside, another crowd of 40,000 were waiting for the game, listening to reactions of those inside and tuned to their radios. Radio was the only way to experience the game live for those not lucky to get their hands on a ticket. Vassilis Georgiou’s radio broadcast, and especially the last few moments of the game is still the stuff of sporting legend in Greece. The stadium explodes in joy when the game ends with AEK beating Slavia 89-82. Thousands of fans invade the court and rush past the dazed Czechoslovaks, who stand astonished, even bemused by the crowd’s reaction. The celebrations spill over outside the stadium, into the streets of Athens. It was a great sporting victory, but also a huge win for the Army Colonels, says an excellent review at explorabilia.wordpress.com. 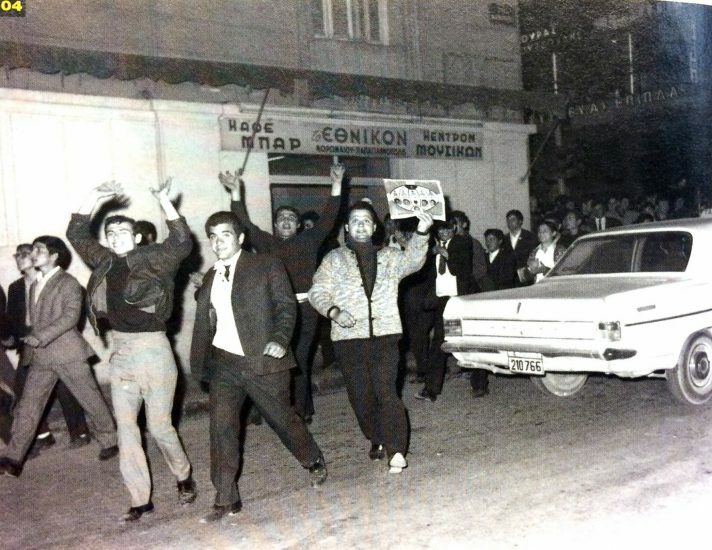 It was a great opportunity to display national pride and unity, and to give the still-cowering people of Greece the chance to rejoice and forget the acute repression they have been experiencing during recent purges. Half a century later, the amazing success was turned into a film by Tassos Boulmetis. In “1968”, released in February, the director recruited a rich and talented cast to present the fascinating backdrop behind a dream that became true that glorious night.